The Trump administration plans to announce at least $US30 billion in tariffs on China. The Dow Jones Industrial Average sank almost 500 points on fears of a trade war. 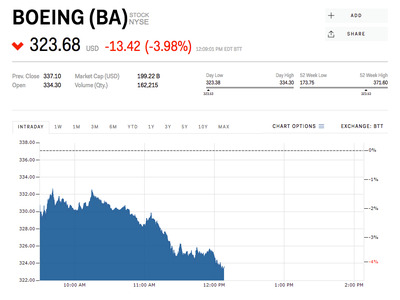 Boeing led the spiral downward, shedding nearly 4%. Major industrial stocks plummeted Thursday as markets anticipated an announcement that the Trump administration will impose at least $US30 billion in tariffs on China, who has vowed to retaliate. Near midday trading, the Dow Jones industrial average was down almost 500 points, or about 2% at the lows. The tariffs are meant to penalise China for intellectual property theft. Last year, the US began a seven-month investigation into China and found strong evidence Beijing had stolen and coerced US companies to hand over intellectual property. Additionally, the Chinese government used state funds to purchase information from American companies. Beijing has repeatedly warned it will hit back with its own taxes on American imports. That has investors running the opposite direction of industries likely to be targeted. All but two of the 30 components of the Dow are trading lower. Boeing led the index lower, trading down 3.61% to $US324.93 near midday. One in four of its jetliners is bought by Chinese customers, according to CNBC. Elsewhere, Caterpillar shed 3.5%. Steel stocks were also under pressure amid ongoing concerns the announced 25% tariff on imports won’t be as stringent as initially expected. The tariff was originally supposed to be imposed on all countries, but the Trump administration has said that there will be exceptions. US Steel trades down 7.33% on Thursday, and is now down 24% from its March 1 high.